Another plant we are hoping will still be in top condition for the London Orchid Show is this amazing Schomburgkia species. 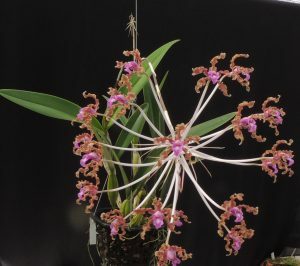 Schomburgkia is a genus related to Cattleya, and includes a number of large growing plants with impressive spikes of unusual flowers. Schomburgkia splendida is native to Ecuador and Colombia where it grows on trees and rocks in dryish forests around 600- 1000m. The unusually twisted flowers are produced in a starburst at the end of the spike and really demand close inspection. From a distance the brown flowers look to be old, dried up and dead, and one wonders whether this is an adaptation to avoid being eaten by grazing animals. We grow the species in open compost in a basket high in our Warm Americas section where it experiences a suitably warm and bright environment.